If you are looking for a beautiful and functional patio, than a flagstone patio might be your best choice. When you are looking at materials to create your patio with, you will discover flagstone as a beautiful, and yet very durable option to create your outdoor living space. Laying flagstone creates a beautiful, natural living space that can be created to match any outdoor space, because it is so versatile and has so many options. 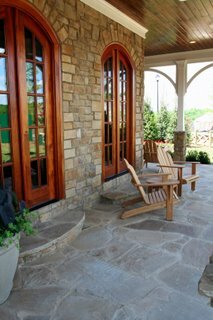 The most common types of flagstone are limestone, slate, bluestone and sandstone. The quality and color varies with each type of stone, and you need to watch for the hardness factor and the level of density of each type of stone, as all of these factors will affect the price factor. Choose slate for the hardest and most non-porous type of stone. The colors of slate can range from green, gray to even a purple color. Limestone comes in many different color choices and ranges from a very dense stone to a very porous and unstable stone. Bluestone and sandstone are chosen for their nice shades of light beige to pink, red and even bluish colors. These types of stone are generally considered softer and easier to cut than some of the harder stones such as slate. When you purchase your material for a flagstone patio, you need to have a rough idea about the area that you are covering. The stones are generally sold by the foot. Be sure to factor in an extra 10% for wastage, sizing and shape when you are creating your patio design. When you layout your patio design, lay the pieces down as you go along so that you can get a good idea for approximate matches, and you can search for stones that are the same thickness. You will need to choose a base for your flagstone patio before you begin the work of laying it out. If you are in an area that does not experience freezing than you may want to choose to lay the flagstone directly on the ground. For this method, you will want to choose a thicker stone. If you choose to use a sand base, a medium thickness stone is appropriate. In addition, if you have a concrete base to work with, a thinner stone is necessary. A concrete base is the most stable choice; however, it also requires the most preparation, and is likely to cost the most of all three choices. Building a flagstone patio is hard and heavy work, and it is important to know what you are doing before you begin your project. Whether you build it yourself or hire a professional, a flagstone patio is a beautiful addition to any outdoor living space.